This short book is based on the true story of Salva Dut, a boy fleeing civil war in South Sudan in 1985. Librarians and teachers, this one is a must. SUMMARY: Alternates between two stories: Nya is an 11-year old girl living in Sudan in 2008. She walks a total of eight hours each day to bring her family water. Salva is an 11-year old boy in 1985. When his village is attacked by rebels, Salva is separated from his family and does not find them for many years. He becomes one of the "Lost Boys" of Sudan. REVIEW: A student recommended this short book to me. I loved the simple writing style and how the stories of Salva and Nya come together at the end. Salva is an 11-year old boy who is based on a real boy named Salva. Right at the beginning, Salva's village is attacked, and Salva's teacher tells the boys (it's a school for boys only) to run to the bush and hide. Salva manages to escape the attackers, but he is separated from his family and has no idea what has happened to them. He wanders alone for awhile before finding a group of people who are headed to Ethiopia to escape the war. Salva goes with them. 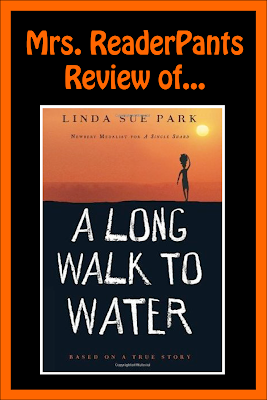 The book is mostly Salva's story, but Nya's story is important to show the current (2008) water crisis in Sudan. Nya walks eight hours every day to bring water to her family. At the end, Nya and Salva's stories converge. 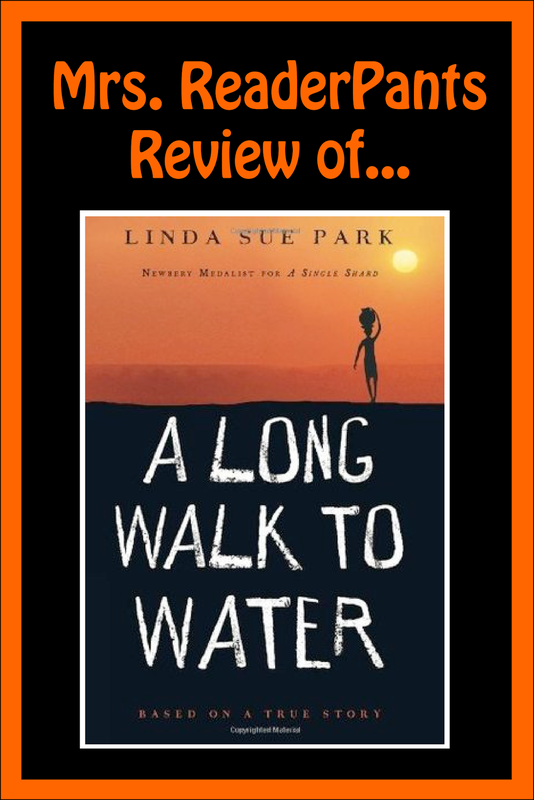 A Long Walk to Water would be a great way to start a discussion of the importance of water and how many people in the world have limited access to clean water. We really do take our kitchen faucets, bathroom sinks, showers, and flushing toilets for granted. I cannot imagine walking 8 hours a day in the blazing hot sun (4 of them carrying a heavy bucket of water on my head) just to drink clean water, yet in the story, Nya does that with relatively little complaint. And as I know from our shoes project earlier this year, many of the people walking to water do so while wearing thin, plastic flip-flops or even no shoes at all. It's very eye-opening. Elementary librarians will want to know that there is violence--a man gets shot in the face, and lots of people are eaten by crocodiles. It's not graphic, but it may bother sensitive readers. THE BOTTOM LINE: A short but important book that will help bring perspective to readers. A must for all middle and high school libraries; elementary librarians are advised about the violence. STATUS IN MY LIBRARY: We have it in our Senior School Library (grades 6-12) and our Junior School Library, which serves PreK-5th grade. I plan to use it in a booktalk about water shortages soon. This has been very popular in my library too. Another excellent book when you're focusing on water is "Every last drop: bringing clean water home" by Michelle Mulder. Not a story but one of the best discussions of water problems in parts of the world. Thanks for your great site. Great suggestion, Julia! I also thought of another one today: Not A Drop To Drink by Mindy McGinnis. It's a dystopia of a future world without enough water. Chilling.